An easy, quick vegan Instant Pot soup. So I joined the Instant Pot bandwagon last Thanksgiving, when the 6QT IP DUO went on sale for Black Friday. It was also thanks to my other kitchen gadget loving “partner in crime” friend/mentor/aunt – (yes she is all of the above) who got me hooked. I’m talking about Anusuya of Anusuya’s Kitchen fame who I have always looked up to for her amazing no-fail traditional (and other) recipes and handy kitchen tips. Of course those who know me well know that I have a kitchen gadget fetish so she just needed to exhale and it was in my next Amazon shipment in about exactly a week😀. I have been trying many dishes since and the most time saving of all is making pasta in the IP. 4 minutes of high pressure and its done! No waiting for the water to boil, no issues with it being over or undercooked, its almost perfectly cooked every single time. More on that in a separate post. I have also been experimenting with One Pot One Shot or OPOS in IP dishes. Of course there is a science to this and I have mentioned about OPOS before here which has changed the way I cook or save time in the kitchen. This particular Instant Pot soup recipe was more on a whim – but a great time saver recipe when you literally want to use one pot to cook. It was one of those crazy days when the kitchen, the stovetop and countertops were just deep cleaned after all the grease from the frenzied cooking that happened over the weekend (Varalakshmi puja and get togethers) – and I realized I still needed to make lunch. I didn’t want to begin to use the stove or the counters. So I started the oven, and literally threw in the butternut squash that was sitting on my table for the last 10 days, to roast it. I have realized that it’s a great time saver to oven roast veggies on a regular basis and store. You can use these in salads, soups or just eat as is. Makes for a quick meal. Turned the IP on, roughly chopped some onions directly into it, added the roasted squash, broth and other ingredients into the pot, blended straight into the pot and this delicious soup was ready in about 20 minutes. (not including roasting the squash). Lightly sweet with a slight spice from the curry powder and chili garlic, this soup makes for a filling lunch. And it’s non dairy (vegan) and gluten free too. 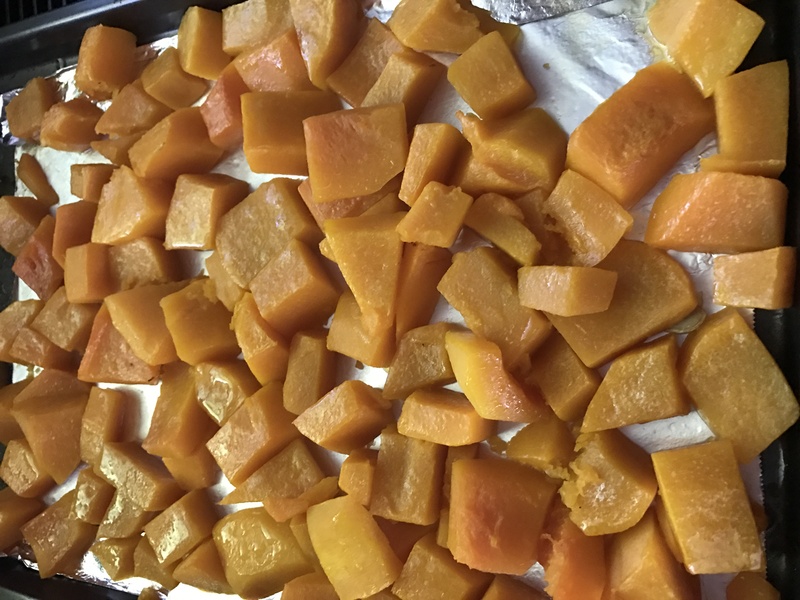 Tip : to roast butternut squash, make some slits in the tough skin, and microwave for about 2-3 minutes on high (Again note that I avoided the stove:). This helps loosen the skin and makes it easier to cut. You can then slice the squash in half, spray some olive oil and roast in the oven at 400F for about 20 minutes or until tender. Chop into chunks and store in fridge or freezer or use in cooking. So this recipe is a One Pot instant Pot soup made with about 10 ingredients, and with no major chopping or stove cooking needed. Let me know if you try it! 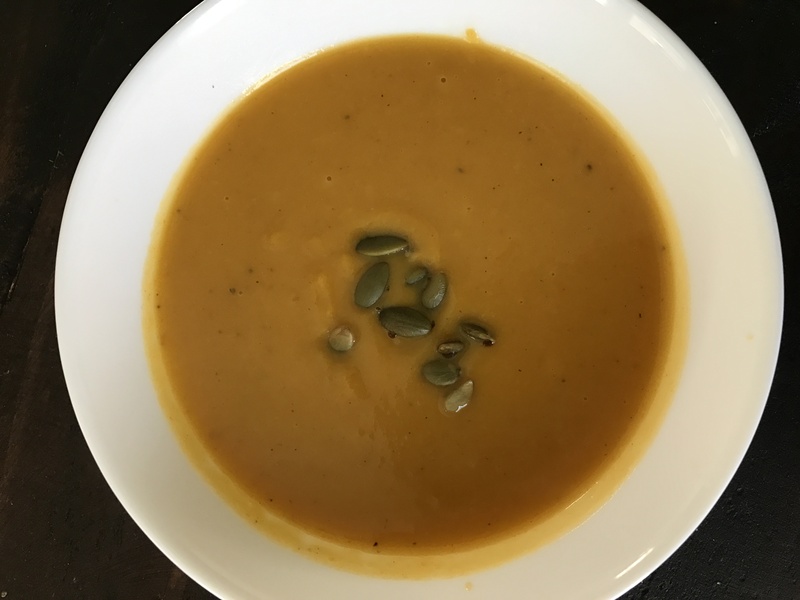 15 minute vegan butternut squash soup made in the Instant Pot. Lightly sweet with a tingle of curry powder and chili garlic to spice things up! Roast the butternut squash in the oven at 400F for 20 minutes or until tender. When it turns "Hot" add the olive oil. Add the chopped onion and garlic and saute till the onions turn translucent. Add a sprig of the rosemary and saute for another minute. Add the chopped roasted butternut squash, mix everything well. Add the curry powder, cinnamon powder, salt and pepper to taste. Mix well and saute again for a minute. Make 2 cups of vegetable broth and add this to the mixture. Add the coconut milk, maple syrup, chili garlic sauce. Let the mixture come to a light boil. Will take about 3-4 minutes. With an immersion blender, blend all the ingredients into a smooth soup. You may also transfer to a regular blender at this step to blend. Serve hot, garnished with some coconut cream, pumpkin seeds. You may add more chili garlic paste or salt and pepper or maple syrup to taste. And so it is ironic or maybe a tad embarrassing that I coach clients on the frequency of posting content – being regular with blog posts, Facebook, Instagram posts and when it comes to my own – the less said the better. I have been quite regular on social media as in Insta is now my mini blog, as you can see here, but I would be lying if I said that’s my new strategy to post regularly. It has just been easier to click a few videos or stories and post on Insta, while posting to Facebook at the same time and adding a few hashtags it’s done! The idea of crafting a detailed blog post is what I have been cringing about – the beautiful images, the step by step pictures and one that I want to live by – the stories for each post. And then I read somewhere that we often put the pressure on ourselves to be perfect. It’s sometimes okay to get the job done and get it out the door within the deadline than procrastinate just because I want to get that A+. So this Punjabi Aloo Gobhi was one I tried about 2 weeks ago. We have been increasingly trying to cook lighter and healthier meals, cutting down on rice and carbs, opting for millets, even with our rotis. Bajra and Jowar roti was a recent addition this month – to help lower the glycemic index in the dishes for the diabetics in the family. With rotis comes the need for a dal (lentils) or beans with gravy and a dry sabzi. Add some raw onions, green chilies and a salad and you have yourself a full nutritious meal. More on the bajra jowar roti recipe in the next post. 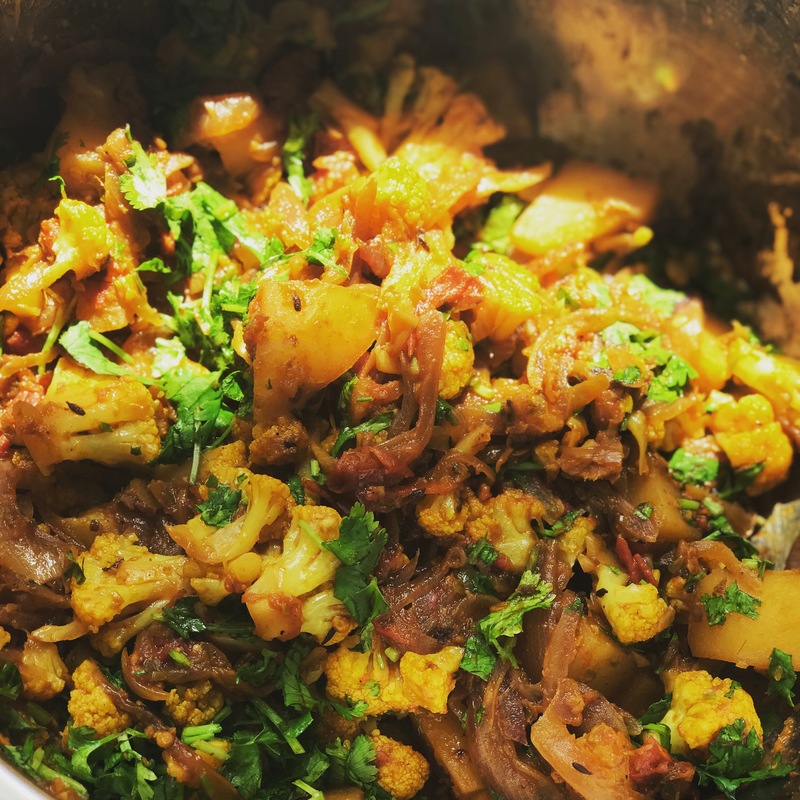 A dry, tangy, mildly spiced potato and cauliflower curry. Perfect accompaniment to rotis, phulkas, parathas and rice dishes. Take a kadai or heavy bottom pan. Add 2 tbsp mustard oil. Let it heat well to smoking point. Keep in mind that mustard oil imparts its flavor only when heated to smoking, if not will taste raw. Add the cumin seeds or jeera and saute for a minute. Add the fennel or saunf and saute. Add the sliced onions. Let it cook until lightly browned. Add the ginger-garlic-chili paste now and cook for 1-2 minutes. Add the turmeric powder, salt to taste. Now add the chopped tomatoes, and let it cook for 5 minutes. You may lightly mash the tomatoes and can also add about 3-4 tsp of water, no more, to just let it all come together. Add the potato now, and saute on a medium flame for 3-5 minutes. You may add another tsp of water to cook the potatoes. Add ½ tsp garam masala. Add the cauliflower, mix well. Cook on low to medium, covered for about 5-10 minutes until done. Garnish with ½ cup chopped cilantro. Serve hot with phulkas or parathas (rotis). Welcome to The Mindful Veggie (previously known as Roz Ka Khana). - a food journal of experiments from my kitchen and others, travel adventures and other daily musings.